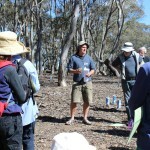 About The Session: Saide Gray and Gary Gibson hosted our ‘To Plant or Not To Plant” session on their 55 hectare (135 acre) Sandon property and provided an ideal setting to explore revegetation methods, including tubestock planting, direct seeding and natural regeneration – all within a short walking distance. We could also observe the results of these methods over time. Thanks to Saide and Gary for their willingness to share their revegetation experiences, both successful and not so successful. 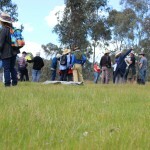 Our presenters Damien Cook (Ecologist and Consultant, Rakali Ecological Consulting) and Connecting Country’s own Jarrod Coote provided a complementary mix on both the theory and practice of revegetation methods. 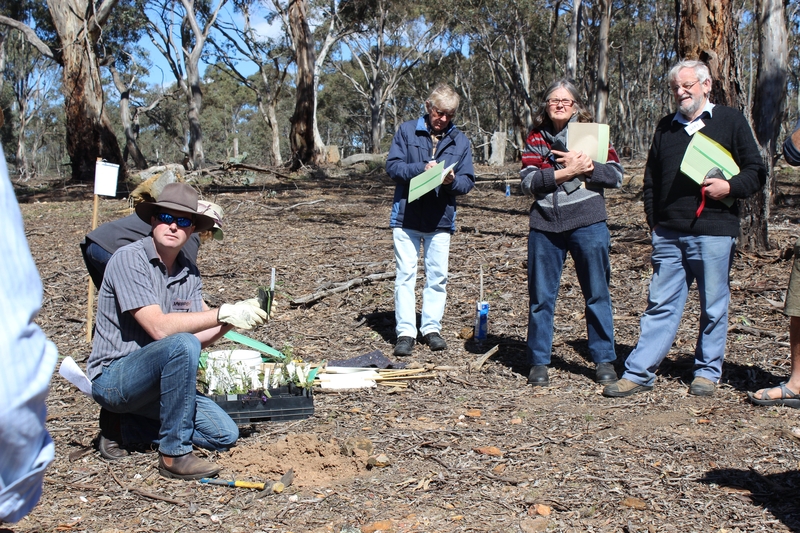 Damien guided us through the basic theory of restoration science; don’t rush, be patient, take the time to observe closely and then try to follow natural ecological processes (developing succession and climax communities) in our revegetation work. Jarrod provided practical pointers and demonstrated how to give seed and seedlings the best (and most cost-effective) chance to succeed. 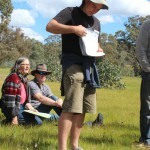 Jarrod also took the opportunity to cover some basics around rabbit control – vital for any revegetation project, but most important in direct seeding where emerging, unprotected plants can be vulnerable to grazing animals. 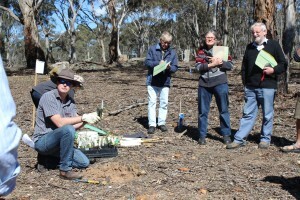 Thanks to Damien and Jarrod for giving their time and expertise, to Frances Cincotta from Newstead Natives for supplying plant samples and other handout material, and to Saide and Gary for providing the fitting venue, their input and insight. 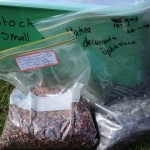 Florabank website – http://www.florabank.org.au/ Florabank is assisting thousands of people every month who want to collect seed, propagate, grow or use Australian native species. 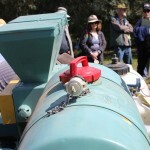 Florabank is an initiative of the Australian Government, Greening Australia and CSIRO. 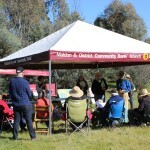 Greening Australia has been funding Florabank since mid 2008. Species Navigator is a unique tool which brings together biophysical and ecological information about species – information which is not easily found – into an interactive key. Around 20 of the top 25 Florabank webpages accessed per month are Species Navigator Fact Sheets, and well over 6000 Fact Sheets are accessed every month. 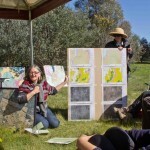 Biodiversity Mapper –http://www.depi.vic.gov.au/environment-and-wildlife/biodiversity/biodiversity-interactive-map – Biodiversity Interactive Map (BIM) is an easy to use tool to display and produce maps of Victoria’s biodiversity, native vegetation, flora and fauna data. 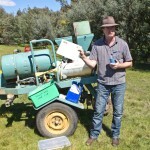 An alternative to efarmer for showing EVC information. 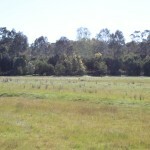 Greening Australia – http://www.greeningaustralia.org.au/about-us – have information sheets and resources on revegetation. 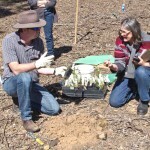 The Tree Project – http://www.treeproject.org.au/ – TreeProject is a non-profit (Charitable), non-government, volunteer-based organization leading the way in sustainable re-vegetation throughout Victoria by providing low cost indigenous seedlings to landholders. seeding tracks; spot the seed! I’m struck by the paradox that in our daily lives we almost take for granted what seems to be an ever increasing degree of diversity – whether it be food, clothes, types of jobs or just about anything else we care to think about – except perhaps ecological diversity. 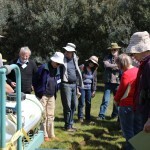 With that in mind Sunday’s Connecting Country workshop on “plant or not to plant” was very relevant with Jarrod’s and Damien’s talks complemented by the wealth of views brought by all the participants – each of whom had different perspectives and issues to deal with. The big takeaway was that how you achieve diversity all depends on your objectives, and the time frame set for meeting them. And perhaps you will never meet your ultimate objective given that the ecological timescale is well beyond that of any human life! Nevertheless, knowing what your journey is certainly will help to clarify what you do. Our hosts Gary and Saide spoke about their objectives in selecting their property with the novel one of it being “seismologically friendly” at the top of the list, followed by their seeking a quiet retreat. Over 20 plus years of clearly diligent work invasive species like thistle have been removed and direct seeding has created a corridor for wildlife consistent with the Connecting Country theme of linking islands of natural vegetation together. The diversity of plants was complemented by diversity in landscape and layout – I felt inspired by what Gary and Saide have done and the passion they still have after all that time. 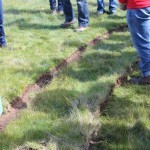 The workshop looked at the pros and cons of hand planting and machine seeding although at the end of the day the choice really comes back to objectives and time horizon. 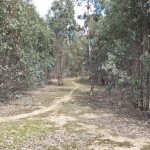 Jarrod’s comparison of the various plant guards and their cost was instructive and equally simple observations around not planting “kangaroo lunch stops” near their trails was noteworthy. In terms of actual planting, and while tongue in cheek, I was also taken with the keen observation that its best to get a child to do the set out for a more “natural” look – adults tend to go for straight lines. Great advice, now just to find a willing child! The bottom line on hand planting is that there is no right answer to set out or protectors – its all a matter of trial and error and it seems to me that whatever works must be natures way of saying “more please”. I found Jarrod’s demonstration of scraping the topsoil and use of water crystals very instructive and will definitely use both in my next planting. For those without the appetite for sore knees and backs, there is machine planting – albeit with a different cost – this time more of a monetary nature. 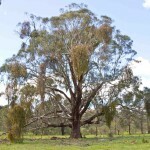 The germination rates varied markedly between species with 0.25% for yellow gum, 2.5% for red gum and around 8-12% for acacias. 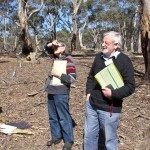 Gary and Saide had planted 6 species (3 eucalypt and 3 acacia) in 5-8 lines around the edge of the workshop site with the density in excess of what natural selection will ultimately arrive at (for eucalypts around 15 trees per hectare, spaced at 25m apart). The interesting thing about machine seeding was that it tended to bypass the normal succession chain of cassinia to acacia to gum and saved quite a few years in between. This could be quite appealing depending on the love one has for various of these plants and time frame. The pros were definitely around humans controlling the speed and type of plantings, the cons related to cost and that the outcome would be more sculptured as opposed to random (and perhaps this might be a pro as well), although ultimately natural selection would lead to what nature felt was “right”. Following the demonstration of direct seeding, Damien discussed the restoration of landscapes back to “what was” pre European settlement. Of great interest was a slightly tangential discussion on mistletoe and whether it was deleterious to the host tree. Damien gave a very interesting perspective that mistletoe was very beneficial to the promotion of biodiversity with its positive impact on butterflies and nectar. What also caught my attention was David’s observation that emerging research pointed to mistletoe being an indicator of a healthy forest. The key take aways from Damien’s talk was that it was important to get in the ballpark by understanding the Ecological Vegetation Class of your area (EVC) and then looking at the “ground truth” as he put it. A sentiment, much like Jarrod’s, was that you need to understand the eco-system in front of you and work with that as opposed to higher-level prescriptions. The Connecting Country reference sheets listed the key mapping links and resources to help start this process (first class materials!). Unfortunately time was limited but not the key learnings. First, be clear on your objective and time horizon. Second, stick with indigenous vegetation. Third, get on top of weeds, invasive species and pests like rabbits (Rabbait seemed to be the go). But above all recognize that we are dealing with the natural world, our understanding is imperfect and continually evolving, and approach the task with a trial and error approach. Plus, as demonstrated by our hosts for the day be prepared to work diligently over time to realize your goal, and when the facts change then change what you do. As Saide send at the end of the workshop; “we opened our eyes and saw things differently”.